Site Title: This title will appear at the top of the browser window. In Internet Explorer, it is the title in the blue bar within the browser. The Search Engine Title is also what shows up in Google and other search engines when people search for a specific term. (It's the blue underlined title in Google.) This title should summarize your site and business in a single phrase or statement. The title is short - you're limited to about 60 characters, including spaces and punctuation. Any additional characters will appear cut off. Site Description: This is also placed inside the site's programming. The description should be about a paragraph describing your business and product catalog. The first sentence is approximately 150 characters, the most important piece of this description, and it is the heart of your paragraph. 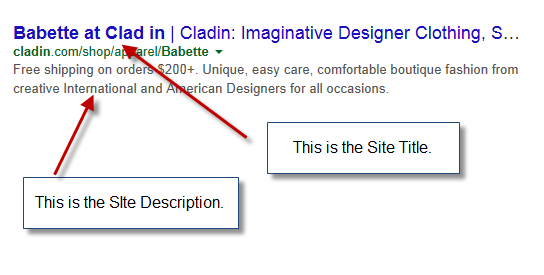 This description appears on the Search Engine Results page, directly under your site's name. Homepage Text: As part of our standard practice, we also include text on the homepage. The text is like a mini About Us. The text should be 3 to 4 sentences about your business. You may include key phrases and brands if appropriate. The text has to be different than both your site description and your About Us content. When describing departments/categories, the description should be about 150 characters, including spaces and punctuation. Just as with the site’s description, this information is placed within the site’s programming and cannot be readily seen by shoppers. When a search is done for the category with a search engine like Google, the description will appear under the Search Engine Title on the results page. Store Manager: You can update these fields by logging into Store Manager > Product Catalog > Departments or Categories. 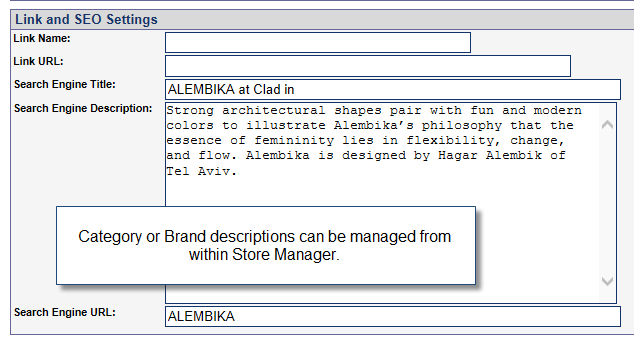 When you use the department and brand descriptions in Store Manager, they will appear with the search result listings. Magento: You can update the department/category fields by logging into Magento > Catalog > Manage Categories. Select the category you wish to edit. Enter your description in the Description field. You can also add keywords in the Meta Keywords field.